Teams of three or four high school students compete in a series of challenging tests to demonstrate their economic understanding and reasoning skills. The Challenge matches your team’s understanding of economics with teams from other schools. Every Michigan school district will have the opportunity to hold a preliminary first round of the Challenge online. 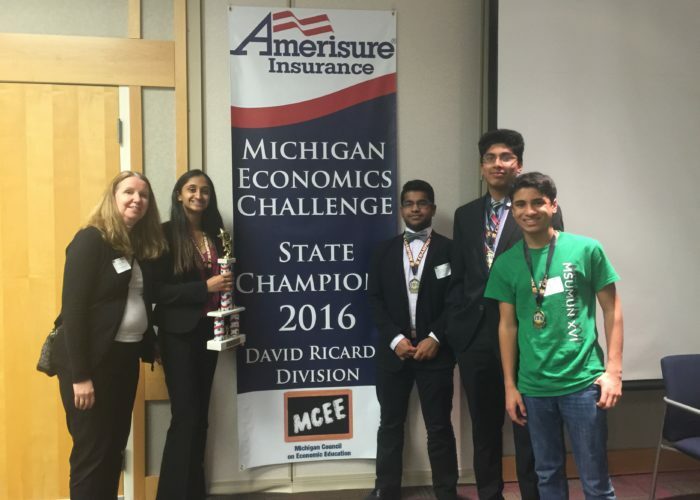 The top teams from across Michigan will be invited to participate in a three-round State Finals competition. The two teams with the highest scores after round three will then compete for the state title in a fast-paced “Quiz Bowl” round. The fun does not stop there! The winner of the state title will compete in an online Regional competition with a chance to qualify for the National Finals in New York! State Finals on March 25, 2019 will pit the top teams in the state against one another. The State Finals will be from 9:00am-1:00pm at Walsh College in Novi. Lunch will be provided. Join us to learn the ins and outs of participating in the online portion of the economics challenge. Topics: how to register, how to create your student teams, and how to obtain your individual and team scores, how to move on to the national semi-finals and national finals. Presented by Jennifer Davidson, President, Nebraska Council of Economic Education.